The new Stripology Squared Mini ruler (designed by Gudrun Erla for Creative Grids) is a smaller version of the popular Stripology Squared ruler and is designed to work with units up to 6 1/2". Whole inch, half inch and eighth inch increments are included, then simply turn the ruler around for quarter inch increments! Squares up half-square and quarter-square triangles too! 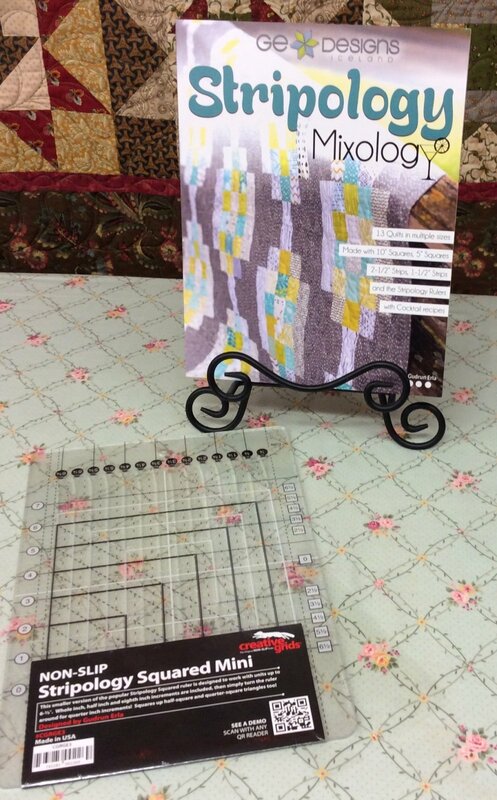 This tool is paired with the new Stripology Mixology book (also written by Gudrun Erla) and contains 13 original quilt designs made from precuts . . . 10" squares, 5" squares, 2 1/2" strips and 1 1/2" strips. Full color instructions for using all three Stripology rulers or regular rulers are included, along with 13 delicious cocktail recipes with which to reward yourself!